This authentic dish of meltingly tender leg of lamb is roasted with garlic, lemon and potatoes for an irresistible Sunday lunch centerpiece. Heat oven to 220C/200C fan/gas 7. Arrange the unpeeled garlic cloves, 3 bay leaves and the lemon quarters in a large roasting dish and cover with 200ml cold water. Sit the lamb on top, drizzle with the olive oil and rub it in all over. Using a small sharp knife, cut small incisions in the lamb skin, then tuck the remaining peeled and sliced garlic and bay leaves into these slits. Season the lamb well and sprinkle over the cinnamon. Cover tightly with foil and place in the oven. Immediately reduce the oven temperature to 150C/130C fan/gas 2. Leave to cook for 4 hrs, skimming the fat from the juices and removing the foil for the final 30 mins of cooking. After 1 hr, put the potato wedges in a large roasting tin, coat them in 4 tbsp olive oil and season well. Roast in the oven with the lamb for 11/2-2 hrs. Transfer the cooked lamb to a large piece of foil, wrap tightly and leave to rest for 20-30 mins. Check the potatoes are cooked (if you need to, turn the oven up to 220C/200C fan/gas 7 to finish cooking). Add the olives and wine to the pan juices, simmer them and keep warm until ready to carve. 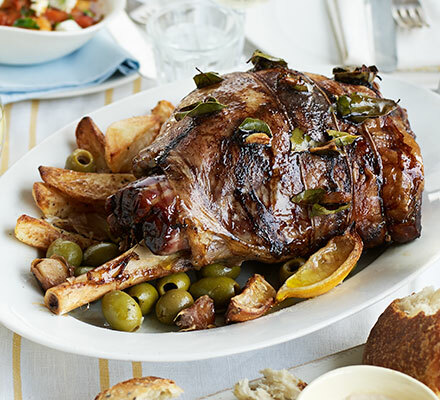 Serve the lamb thickly sliced with the olives, potatoes and Tahini & lemon sauce (see ‘goes well with’), with the meat juices poured over at the last minute.